This week - another Kansas City style sauce, with somewhat better results. Trader Joe's is coming to Nashville. Those of you who live in larger metropolitan areas are probably saying, "big deal", but we Nashvillians are relatively new to the world of upscale grocery stores. Trader Joe's is the latest in a procession of high-end grocery retailers to Middle Tennessee, following Fresh Market in 2005 and Whole Foods in 2007. Trader Joe's tends to be a little less expensive, and a little more focused on their own store brands. Having had limited exposure to the store over the years, I look forward to seeing what all of the hype is about when their new store opens in Green Hills this fall. 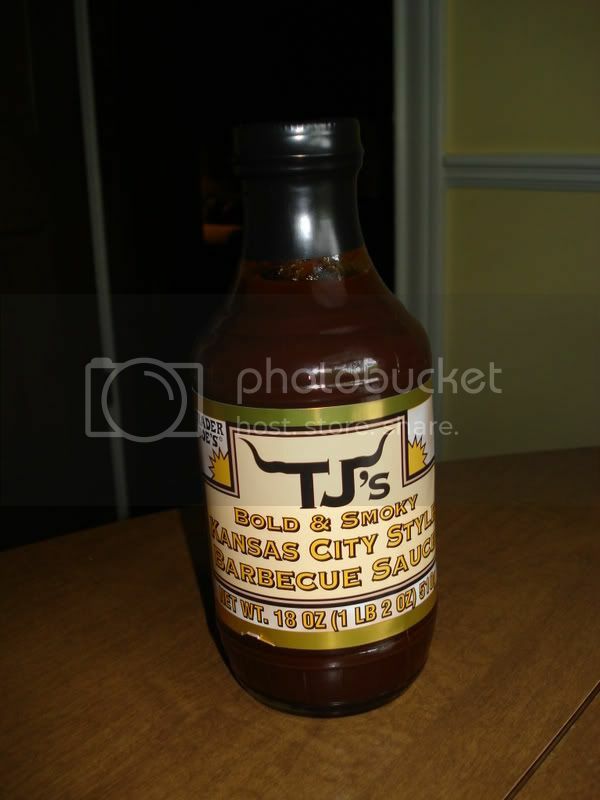 In the meantime, I was able to get my hands on a bottle of their "Kansas City style" barbecue sauce. It's an attractive looking sauce, with deep burgundy color and a glossy shine. It's thick, like a KC-style sauce should be, but still very pourable. The dominant aroma is hickory smoke, and smoke is also a major component of the taste of the sauce. There is definitely a rich molasses sweetness, complemented by hints of onion and garlic, and did I mention...really smokey! Overall, this is quite a tasty sauce, heavy and strong, but not overpowering. Not too bad for a grocery store brand!